Tell me about your football career. I started playing Junior football when I signed for Penicuik at the young age of seventeen, a long time ago, and I was there until the team folded. From there I went to Meadowbank Thistle and spent three years with them. I didn’t really break through until my second season there when Donald Park took over. Unfortunately I got a bad knee injury playing a friendly against Hill O’ Beath that put me out the game for almost four years. After that I played for Rosyth Juniors for a couple of seasons, and then I went to Musselburgh Athletic before coming back to Penicuik. Which team did you enjoy playing with most and why? To be honest, I would have to say Musselburgh. Having had a bad knee injury, I really didn’t think I would be able to play again, so to go back to play at a decent level, under a manager, Gordon Smith, who I thought was brilliant, really made my stay there enjoyable. What would you say was the highlight so far of your career in football? 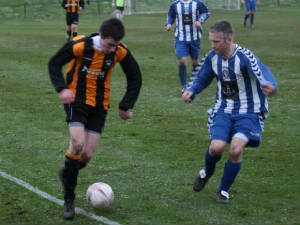 That would have to be my debut for Meadowbank. I remember Donald Park just got the managers job after Terry Christie resigned and we were playing Partick Thistle at Firhill. They needed a point to get promoted to the Premiership and we beat them 1 – 2. I only found out an hour before the game that I was playing and to cap it all, I played really well. That was the first time I played in front of a big crowd of 9000 and that was quite an experience. Tell me about the managers you have played under. There was Gordon Smith who brought me to Penicuik when he was player manager, not the most knowledgeable manager when it comes to tactics, but he was brilliant at motivating players. From a knowledge and tactical point of view, Donald Park was the best - he taught me all about third man running and that kind of stuff. I also played under Tom Hendry and Jim Leishman who were complete opposites. Tom would have you in early and talk tactics non stop for 45 minutes, whereas Jim Leishman would have ten minutes of poetry that had nothing to do with tactics, but by the time he was finished, you were highly motivated. 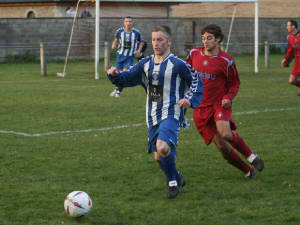 What made you decide to sign for Penicuik? I was a bit unhappy at Musselburgh towards the end, the manager had moved on and things were happening, and to be frank, I lost the will to play for them. 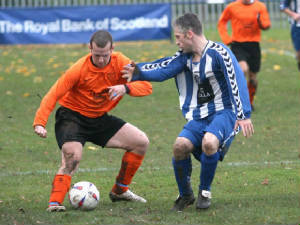 I am a Penicuik lad, and I liked the way the team was run. I wanted to play football for people and a team I liked. Other teams were interested in signing me, but Willie McGinley spoke to me and his views on how and where I should play coincided with mine, so I was happy to sign for him and the club. The only regret I have is that I suffered from injury, and did not get the opportunity to pay him back for the faith he showed in me. What objectives do you set yourself at the beginning of the season? Since I came to the club, it was to be fit for a season as my objective, mainly because of the bad run of injuries I have had, and it got to the stage of playing the game hoping not to get injured rather that playing football to play well. I actually gave up at one point, but my wife talked me into coming back. This season, I won’t be happy if we don’t get promotion and have a good run in the Scottish. How would you describe your form so far this season? I would say it was decent. I have had a couple of stinkers, a couple of really good games, and I have had quite a few games I would describe as average. I have done all right, and I have played more games this season than I thought I would, which is good, because I don’t think about getting injured any more. However I believe I can play better. Who do you think will be our main rivals and why? Musselburgh, poor defence, but a good attacking team, Newtongrange, because they always come on strong and perhaps Carnoustie. The games between those sides will decide who goes up. We have had a great start to the season – what is the difference from last year? We now have four new defenders, a core of experienced players who know what the game is about, and some new players up front. All this has added to the strength of the squad and every player has to be on his game because there is cover, and if I play rubbish, I know there is someone there to take my place. There is a good atmosphere in the dressing room and there is a different mindset in that everyone in the squad wants to win for Penicuik Athletic. What do you personally hope to achieve this year? Winning the league and gaining promotion to the Super League is what I want. A run in the Scottish would be really good for the fans and bring them back in numbers, and from past experience, I know what it is like to play in front of big crowds. 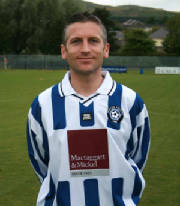 That was another of the reasons I came back to Penicuik, because they always had decent crowds watching you play. If we do well, I really hope they will come back to support the club. Who has best footballing brain in the team and why do you think that? Me! In the past when I was younger, I used to run about all over the place, not quite like a headless chicken, but as you get older, you get a bit wiser. Up top, and technically, I think I know more than most. 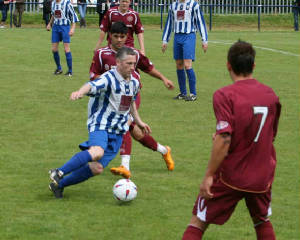 I remember seeing you play for Penicuik as a teenager, how does it feel to come full circle and play with the side again? I believe I am a better player now because I know much more about the game. I was obviously fitter back then, and I enjoyed it first time round simply because I was never injured. Up until now it has been a disaster for me, but this season, so far I’m loving it. I have missed three seasons through injury and this is the first time I am injury free and I am now starting to really enjoy playing. Finally, what are your interests outside football? The only thing I do outside football is spend time with my wife Lisa and my son Daniel, other than that, it’s work. I don’t do anything other than that, so it’s good to get out for football, and apart from that I think Lisa is glad to get me out the house at times.